Business groups have urged the Chancellor not to increase the tax burden on either companies or consumers in next month's Budget. The British Chambers of Commerce (BCC) said Philip Hammond should help firms prepare for Brexit rather than prioritising "giveaways". The British Retail Consortium called for a series of measures to bolster the retail sector. They include freezing income tax rates for most taxpayers. Such a move - along with speeding up rises in personal tax allowances - would help keep the cost of living down for consumers, according to the BRC. It also wants a rise in business rates due to take effect in April 2018 to be scrapped. Helen Dickinson, BRC chief executive, said retailers faced a £270m increase in their business rate bills. "With retailers' margins being squeezed to their limit, this is money that could be better spent investing in keeping prices low for consumers," she said. The retail sector, the UK's largest private sector employer, is being buffeted by headwinds including rising prices following the slide in sterling since the Brexit vote, and the move away from the high street to online shopping. Retail sales suffered an unexpectedly sharp fall of 0.8% in September, reversing a jump in August, the Office for National Statistics said last week. 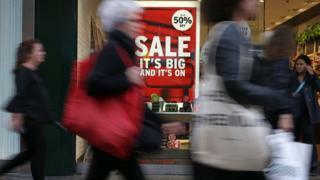 Prices continued to rise across the retail sector, jumping 3.3% compared with the same month last year, the ONS said. Meanwhile, the BCC has called for a "Brexit investment allowance" while the Government negotiates the terms of the UK's departure from the European Union. Director-general Adam Marshall said Mr Hammond must be bold and focus on economic confidence and investment in the Budget. "Action to slash the up-front costs faced by business, to incentivise investment, and to improve mobile coverage and infrastructure would lead to a real boost to productivity, wages and trade," he said. "A Budget that prioritises goodies and giveaways rather than future-proofing the economy would be a dereliction of duty by the government as a whole."